The Women of Marvel talk taking over the universe at New York Comic Con -- and they want YOU! The surge of girl power in comics was a huge presence at New York Comic Con this year and you don’t need any more evidence than the Women of Marvel panel that took place on Day 4. The audience was completely packed and ready to hear about some of the newest developments in Marvel comics, but also about how they’re being driven by women. Considering how New York Comic Con and its predecessors began in comics, this panel was a victorious culmination of progress in a beloved, but still male-dominated, field. Moderated by Judy Stephens, producer at Marvel Entertainment, the panel was full women working in comics, TV, and themed entertainment. So, there it was – an entire panel of women in charge of spreading the best of the Marvel brand in every aspect of entertainment. It seemed like there was a source of inspiration in every corner, whether an aspiring young person – girl or boy – wanted to get into writing, drawing, or something even bigger. But first, here’s what they’re making! After Marvel’s Director of Content and Character Development (and Lead Asskicker) Sana Amanat kicked off with cover art featuring Jennifer Walters as the Hulk – not She-Hulk! – and America Chavez, who is finally getting her own comic, the discussion turned to Moon Girl and Devil Dinosaur. Writer Amy Reeder was thankful to Marvel and her fans for getting “Moon Girl” Lunella Lafayette established as “the smartest person in the entire universe.” That quickly segued into The Unbeatable Squirrel Girl, which will show us all that “we’re all more terrible around our parents when we get home.” Artist Erica Henderson was there to talk about her, and Amanat said the Squirrel Girl comics were great for introducing people to comics (They were also really happy about all the Squirrel Girl cosplayers). The best part was the tease for the Earth’s smartest meeting the Earth’s mightiest somewhere down the line, which seems like it could be incredibly fun. From there, the discussion turned to Captain Marvel. According to writer Margaret Stohl – who is also promoting her Black Widow books and upcoming tour – Carol Danvers is “not that into fame,” and Amanat added that she finds herself in a place where she’s “the most famous and the most hated.” Later while taking questions from the audience, Amanat said that Captain Marvel plays a “very big role” in the upcoming Civil War II arc: “Sometimes, you have to make really hard decisions and not everyone is going to like it.” Stohl said they would be exploring Danvers “as a hero, as a person, as a solider, as a leader.” All this plus the Captain Marvel movie is really going to push this character to the Marvel forefront. The sweetest moment came from a very young Captain Marvel cosplayer who expressed sincere concern over the relationship between Danvers and Ms. Marvel, Kamala Khan. Amanat urged her to read Issue #11 and said the two characters “love each other,” but have a very complicated relationship. Stohl also said that she would “never give up” on those two characters. Outside the world of comics, the panel featured costume designer and stylist Stephanie Maslansky, who works on Marvel’s Netflix series and talked about Luke Cage’s now symbolic hoodie, Misty Knight’s famous dress in her opening scene, and how much fun it is to dress the legendary Alfre Woodard as Mariah, making her wardrobe darker as she became increasingly corrupt (And also celebrating Woodard’s decision to wear flats instead of heels). Kelsey Damassa, Marvel’s Themed Entertainment Coordinator, also discussed her work in theme park attractions that brought the Marvel Universe to life on an actual human scale, as well as their Super Heroes Half Marathon. But one of the coolest announcements was comics-related, but non-fiction: Madaya Mom is a collaboration with ABC News that will bring the story of a real woman living in Syria to life in the form of a graphic novel which is free to view online. Much like the Women Warriors panel, the overarching message to women aspiring to enter the comics field was to create, create, create. 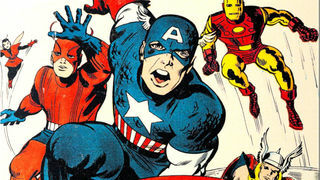 The panel urged anyone with stories to tell to put their work online, pointing out that Marvel finds their talent there. So, what are you waiting for? Marvel is waiting for you!